As much as I love to hate Tom Ford and his excessiveness (especially with anything noir and/or oud-related) - when it comes to floral his artistic direction is just right. Velvet Gardenia is haunting, beautiful and with an intriguing candle-wax and labdanum base notes; and Shanghai Lily unusual yet strangely pretty. While I was a bit disappointed with Champaca Absolute's intensely fruity-fresh and shampoo-like quality, I still find it oddly interesting, and many of the other seasonal floral releases were intriguing even if not enough to warrant a full bottle purchase (that only happened with Velvet Gardenia), and the entire floral Jardin Noir collection (with purple label) smelled promising, namely Café Rose and Ombre de Hyacinth - even I did not get around to try them on yet. I didn't make much of Jasmin Rouge when I tested it on scent strip at Holt Renfrew, where I was also given a sample of it just because they had one in stock. It just did not smell like jasmine on paper, so I didn't bother trying it on my skin. Admittedly, it was not until this jasmine series and noticing it was mentioned favourably in a few jasmine features by other blogs. They were right. Jasmin Rouge turned out to be one of if not the best jasmine perfume I've sampled in the last three weeks. It was created by nose Rodrigo Flores-Roux, a most prolific and productive perfumer who knows both how to create expressive florals, rich orientals and effervescent fresh and citrusy fragrances: He is the nose behind the magnificent Anima Dulcis (Arquiste), and many other fragrances for that line including L'Etrog; Donna Karan's Black Cashmere, Essence Wenge and Essence Labdanum, and too many others to count. 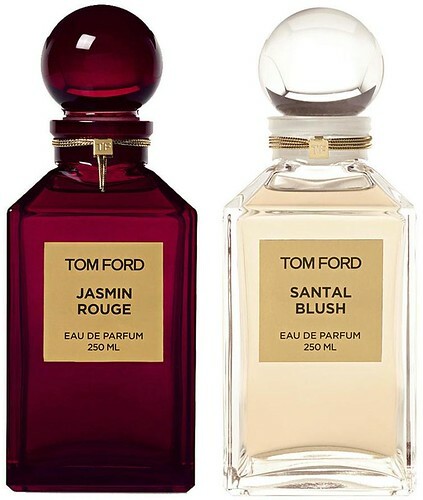 He has already worked with Tom Ford on Neroli Portofino (in 2011, the same year as Jasmin Rouge was launched in conjunction with a make up collection - hence the names such as "Santal Blush" and "Jasmin Rouge"), and more recently (2013) Fleur de Chine. Jasmin Rouge is a realistically convincing yet imaginative jasmine. It begins with a strong, unmistakable jasmine cloud, as if you've just passed a bush full of flowers while blindfolded, and taken by a pleasant surprise. Next you might notice an emphasis on fruity notes - plum, apricot and peach, but these are very grown-up fruits, nothing like the fruit punches you get in the teeny bopper lip-glosses, but that is not to say the fruit notes are dry or overripe either... They are subtle accents that give the perfume an deliciously juicy, almost edible presence to the otherwise too serious or toxically beautiful white flowers who are the true stars of this fragrance. Next you'll notice a tuberose/gardenia/orange-blossom quality of methyl anthranilate, which also adds to the juiciness but in a darker, more sinister way (methyl anthranilate also developed in the more advanced stages of the decomposition of corpses). With all that being said, the jasmine maintains its character throughout, but there are some darker notes in there giving it more depth - hints of spices, resins and balsams. The jasmine itself possesses both the qualities of tea and of milky stone fruit, which makes me think of jasmine sambac variety - but I am also smelling jasmine grandiflorum, with its more pronounced indole. If compared to Serge Lutens A La Nuit though, the sambacness of this perfume is a little more pronounced. 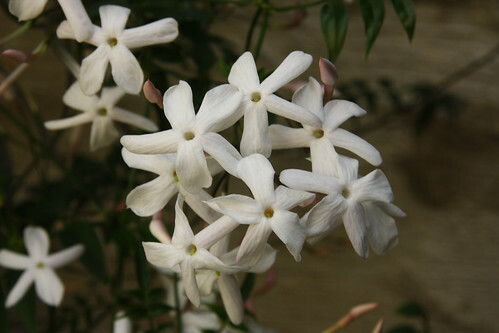 But on its own, I wouldn't think of it as any particular variety of jasmine. There is also a hint of a fatty, modern-day lipstick-like quality as the perfume dries down, to prove that this perfume goes to the extreme to promote upscale makeup. And while there are myriads of spices, flowers and even leather and herbs (Clary Sage) listed in the notes, they only perform as accents to the jasmine, which is for a change truly the main focus of the perfume.